Click here to view the latest version of this article, based on the QS BRICS University Rankings 2019. 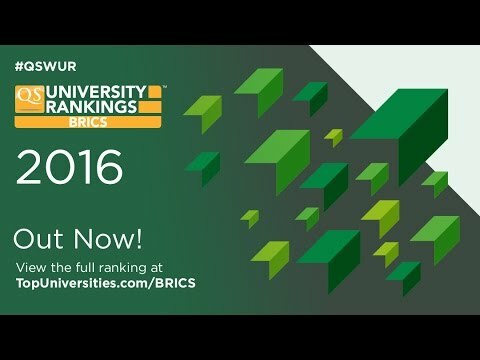 The results of the QS University Rankings: BRICS 2016 are out now, showcasing the top universities in the five BRICS countries (Brazil, Russia, India, China and South Africa). Released annually, the BRICS ranking highlights higher education leaders in these five major emerging economies. 44 Indian universities are featured in the top 250 of this year’s BRICS ranking – read on for an overview of the 10 top universities in India this year, or click here to view the full table. The Indian Institute of Science Bangalore (IISc Bangalore) is a specialist public institution which leads the way for India in the BRICS ranking, at 6th place this year. It also made its debut appearance in the overall QS World University Rankings in the 2015/16 edition, in which it was ranked 147th. Located amongst a center of research institutes just north of the city of Bangalore, IISc Bangalore is well regarded for its research in technology and engineering. It was originally founded in 1909 with two departments and just 21 students, and now has 39 departments across 400 acres of land, and 3,500 students. As well as achieving 33rd place in the QS University Rankings: Asia 2016, IISc Bangalore is featured among the world’s best for 12 subjects, including a place in the top 50 for materials sciences, and the top 100 for chemical engineering, electrical engineering and chemistry. Indian Institute of Technology Bombay (IIT Bombay) climbs from 16th to 13th place in this year’s BRICS ranking. IIT Bombay was founded in 1958 and has since established itself as one of the top universities in India. Mainly a technical institution known for its engineering and science courses, it also offers a variety of arts and humanities programs. IIT Bombay builds links with peer universities both in India and abroad, in order to enhance its research and study programs. It’s located in the Powai area in the north-east of Mumbai (formerly known as Bombay) and has around 8,000 students. IIT Bombay is ranked among the world’s best in 14 subjects, including a place in the global top 100 for computer science, chemical engineering, civil and structural engineering, electrical and electronic engineering, mechanical engineering, materials sciences, and art and design. The Indian Institute of Technology Delhi (IIT Delhi) is ranked 15th in the BRICS ranking this year. Originally founded as an engineering college in 1961, it now has 11 inter-disciplinary centers, in which its engineering and science programs often overlap. Its 325 acre campus is located in the attractive Hauz Khas area, south of the capital city of New Delhi. The campus is also close to a number of other universities, including Jawaharlal Nehru University and the National Council of Educational Research and Training (NCERT). Internationally ranked in 14 subjects, IIT Delhi is within the top 100 worldwide for computer science, chemical engineering, civil and structural engineering, electrical and electronic engineering, mechanical engineering, materials sciences, and art and design. Coming 19th in the BRICS ranking this year, the Indian Institute of Technology Madras (IIT Madras) is another of the top Indian universities to have been founded in the mid-20th century (1959). It has around 8,000 students currently enrolled at its campus in Chennai (formerly known as Madras), which is the largest cultural, economic and education center in South India. Its location also boasts great natural beauty, and is adjacent to the Guindy National Park. IIT Madras is currently featured among the world’s best for nine subjects, including a position in the global top 100 for chemical engineering, civil and structural engineering, electrical and electronic engineering and mechanical engineering. The Indian Institute of Technology Kanpur (IIT Kanpur), also founded in 1959, places 22nd in the BRICS ranking this year. Located on extensive 1,000 acre grounds just outside the city of Kanpur (in the northern state of Uttar Pradesh), around 7,000 students are enrolled. Like the other institutes of technology, its main focus is on engineering and technology subjects, but it also offers a selection of programs in arts, humanities and social sciences. IIT Kanpur was the first Indian institute to offer education in computer science. IIT Kanpur appears in the QS World University Rankings by Subject 10 times this year, achieving its best position (in the global top 100) for electrical and electronic engineering, and a place in the top 150 for seven other subjects, including computer science and statistics. Another of the top technical Indian universities, the Indian Institute of Technology Kharagpur (IIT Kharagpur) is ranked 25th in the BRICS ranking this year. Originally founded in 1951 as a training institute for scientists and engineers, it was the first of the Indian Institutes of Technology to be established, and now teaches around 9,000 students. Its campus is also the largest among the IITs at 2,000 acres, and is located in the city of Kharagpur in north-east India, 116 kilometers west of Kolkata. Of the 11 subjects in which IIT Kharagpur is internationally ranked, it unsurprisingly performs best in engineering fields, placing in the top 100 for civil and structural, electrical and electronic and mechanical engineering. At 39th in the BRICS ranking, the Indian Institute of Technology Roorkee (IIT Roorkee) only recently became an Indian Institute of Technology, in 2001. It was founded in 1847 and given university status in 1949, when it became known as the University of Roorkee. The institute now has 21 academic departments offering programs in engineering, applied sciences, humanities, social sciences and management, with a strong focus on technological and scientific education and research. The university also lays claim to having three centers of excellence – devoted to nanotechnology, transportation systems and disaster mitigation and management. IIT Roorkee is featured in the subject rankings seven times this year, achieving its best position for civil and structural engineering (in the top 150). The highest ranked of the non-IIT Indian universities this year is the University of Delhi, which is 41st in the BRICS ranking this year. Considered one of the best multidisciplinary universities in the country, it’s made up of a collegiate of 77 affiliated colleges and teaches around 132,400 students. It was established in 1922 by the then British Indian government and has now grown to become one of the largest universities in India, made up of two large main campuses in New Delhi – the North Campus and the South Campus – the latter of which boasts 69 acres of green, hilly terrain. The University of Delhi is ranked among the world’s best for 12 disciplines in 2016, including 18th place for development studies, and a top 100 position in the new anthropology ranking. The University of Calcutta is joint 54th in the BRICS ranking this year. Like the University of Delhi, it is a multidisciplinary, public university. It was founded in 1857 in the city of Kolkata, formerly known as Calcutta, which is the major commercial, cultural and educational center of east India. It now has a total of 14 campuses spread across the city and its suburbs, with over 23,000 students enrolled. The university has established a strong reputation for itself both in and outside of India. Not previously featured in the QS World University Rankings by Subject, the University of Calcutta this year ranks in the global top 300 for modern languages. Sharing 54th place with the University of Calcutta in this year’s BRICS ranking, the final of our 10 top universities in India is another IIT, the Indian Institute of Technology Guwahati (IIT Guwahati). It’s a young IIT, established in 1994 by the Indian government. Its 700 acre campus, positioned on the northern banks of the Brahmaputra River just outside the city of Guwahati, northeast India, is considered one of the most beautiful in the country. The university has six research centers with a focus on energy, environment, educational technology, nanotechnology, mass media communication and instruments facility. IIT Guwahati is ranked among the world’s best for four subjects – electrical and electronic engineering, mechanical engineering, chemistry and computer science.